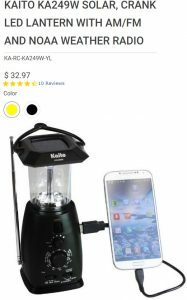 Your emergency supply should include emergency radios so that even when there is a power outage that lasts for a long time, you stay updated on the happenings in your area. You will need to rely on emergency radios during a natural disaster for survival. Knowing weather conditions helps you get organized and operate as a unit. Disaster preparedness gives you peace of mind knowing that you can survive during an emergency. Over the course of the years, I’ve seen a lot of these due to where I live, and one of my friends who happens to be a “radio guy.” He is a licensed ham radio operator, and also develops all sorts of cool radios. We happen to have one of his home-made ones that he created out of a cigar box. He has developed kits for a lot of people ranging from ones that fit into an “Altoid” tin to other containers. It’s really fun to see what he comes up with!. When it comes to emergency radios however, there isn’t much wiggle room. 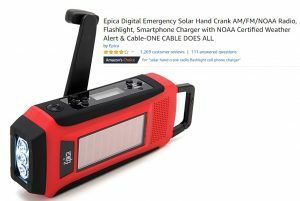 In my opinion, having a hand crank radio with National Oceanic and Atmospheric Administration (NOAA) weather bands on it is likely going to be a good bet. This is probably my favorite, found over at Survival Frog. I took a screenshot of it and placed it at the left here, shown in black, and charging a cell phone. I always love tools and gadgets that check off a bunch of boxes when it comes to being prepared, and this one checks off a lot. Besides being solar powered and dynamo (hand crank) powered, you can plug it in. Only 10.3 ounces – so very lightweight. Weight is always of critical importance when you’re on the go. If you have ever gone hiking or backpacking, you already know that! This also gets good reviews at Survival Frog. One reviewer had a problem with it, but Survival Frog chimed in to tell the customer to reach out so they could help make it right. Now, coming in at only $35 or so, this model is reviewed at an average of about 4 stars on Amazon. 52% are 5 stars, 19% are 4 stars, with 13% at 1-star. One of the 1-star reviewers said it’s flimsy. But, if you are short on money and just want something quick, this might do the trick. Enough 5-star reviews told me what I needed to know – it’s for an emergency, and while it charges your phone slowly, it does actually do it. Also available at Amazon for about $30, with 65% 5-star reviews. Not a bad little radio! 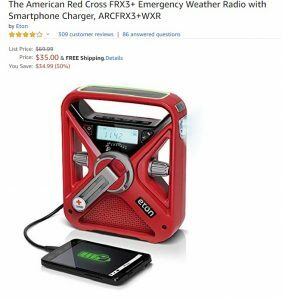 It is a self-charge, hand crank radio, with I think is the best way to go. Here are a few “runner ups” in the radio sector. While a good thing to have in the house, I would definitely want to have a good hand-crank radio for the go bag. You can get it at Amazon for about $28. Over 2,200 customers can’t be wrong. It averages 4-stars (65% are 5-star). I didn’t find this one on Amazon, but on the company site, MidlandUSA.com. Like the other Midland model, this is not a hand-crank unit, but appears to be a good option for the house. Their customers give it an average of 4.4 stars out of 5. I’ll add to this page as I identify more emergency and weather radios! Disaster preparedness allows you to have peace of mind knowing you have a means of survival. Ensure you include a radio in your checklist, so you get alerts and stay updated. Personally, I’d be going for a hand-crank model. I don’t know anyone who would disagree. Yes, have a household model like the Midland or similar models, but for your go-bag, crank it up!